Join us as we bring together and celebrate artists, writers, activists and community workers to explore contemporary challenges facing queer and 2 Spirit Indigenous communities. 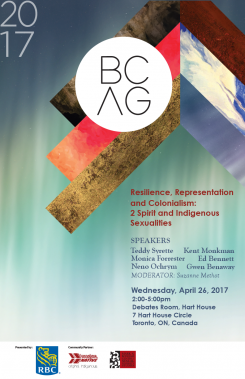 This panel looks to create space to share stories of resilience, representations and resistance to settler colonial constructs of gender and sexuality. Teddy Syrette is an Anishnaabek, 2-Spirit gender-fluid person of Batchewana First Nation. Teddy is an outspoken Queer-Indigenous advocate and storyteller. Their background includes a diploma in social service work in Native specialization at Sault College. They are also experienced in community Arts training, writing and theatre performance. Teddy currently lives in Toronto and is currently working part-time as the Youth Outreach Coordinator for ODE: Remembered Voices, a drop-in program for 2-Spirit youth living in Toronto. Neno, her/she them/they pronouns are a 2Spirit activist and community support for both Indigenous 2Spirit lgbtq+ And Black people. Sharing space both in Toronto and remote Nothern Ontario reserves and or communities, Neno dedicates her daily work to reconciling the rights and roles for 2Spirit & LGBTQ+ people to have acces to culture and traditions. Recently granted $10,000.00 from ArtReach, Neno has created an Indigenous Youth-Led regalia program that solely focuses on 2spirit youth and restoring 2Spirit roles within Powwow ceremony. Youth participents embark on a 10 week journey from learning Powwow history, Dance styles, Regalia making, music and even accessing opportunity to receive Spirit names and or colours. This is the only program of its kind. Neno thanks you all for welcoming her to the Panel. Gwen Benaway is a trans woman of Anishinaabe and Métis descent. Her first collection of poetry, Ceremonies for the Dead, was published in 2013, her second collection of poetry, Passage, was released in 2016 from Kegedonce Press and her third collection of poetry, What I Want is Not What I Hope For, is forthcoming from Bookthug in 2018.In 2015, she was the recipient of the inaugural Speaker’s Award for a Young Author and in 2016 she received an Dayne Ogilvie Honour of Distinction for Emerging Queer Authors from the Writer’s Trust of Canada. Ed Bennett is a gay, queer, 2 Spirit Inuk from Happy Valley-Goose Bay, Labrador. Ed has 20+ years working with Aboriginal people, organizations and communities. He sits on the Board of Directors with Prisoners with HIV/AIDS Action Support Network in Toronto. Ed currently works as the Executive Director with 2 Spirited People of the 1st Nations. Ed currently resides in Toronto, Ontario. Kent Monkman is a Canadian artist of Cree ancestry who works with a variety of mediums, including painting, film/video, performance, and installation. He has had solo exhibitions at numerous Canadian museums including the Montreal Museum of Fine Art, the Museum of Contemporary Canadian Art in Toronto, the Winnipeg Art Gallery, and the Art Gallery of Hamilton. He has participated in various international group exhibitions including: The American West, at Compton Verney, in Warwickshire, England, Remember Humanity at Witte de With, Rotterdam, the 2010 Sydney Biennale, My Winnipeg at Maison Rouge, Paris, and Oh Canada!, MASS MOCA. Monkman has created site specific performances at the McMichael Canadian Art Collection, The Royal Ontario Museum, and at Compton Verney, he has also made Super 8 versions of these performances which he calls “Colonial Art Space Interventions.” His award-winning short film and video works have been screened at various national and international festivals, including the 2007 and 2008 Berlinale, and the 2007 and 2015 Toronto International Film Festival. His work is represented in numerous public and private collections including the National Gallery of Canada, the Denver Art Museum, Montreal Museum of Fine Arts, Museum London, the Glenbow Museum, the Museum of Contemporary Canadian Art, the Mackenzie Art Gallery, the Art Gallery of Ontario, the Smithsonian’s National Museum of the American Indian and the Vancouver Art Gallery. Kent Monkman’s new, large scale project, Shame and Prejudice: A Story of Resilience, takes the viewer on a journey through Canada’s history that starts in the present and takes us back to a hundred and fifty years before Confederation. Suzanne Methot is a writer, editor, educator, and community worker originally from Sagitawa (Peace River, Alberta). She has written for the Toronto Star, The Globe and Mail, Quill & Quire, Windspeaker, and Canadian Geographic, and has also been a commentator for CBC Radio One. Suzanne has 25 years’ experience in elementary, secondary, and post-secondary education, as well as in community-based, direct-service agencies. She is co-author of the Grade 11 textbook Aboriginal Beliefs, Values, and Aspirations (2011) and is also a primary contributor to Scholastic Canada’s Take Action series of classroom resource books (2016/2017). Her non-fiction book Legacy: Trauma, Story, and Indigenous Healing will be published by ECW Press in Spring 2018.